A few days ago my friend Arun Paul Alex , suggested we go to The Smoke House Grill and Eat steaks. I said we are Slumdogs, we need to slum it out. Besides, there is no twist and bite in going to a restaurant and reviewing it. The whole romance is in finding an exciting and local place to eat and drink cheaply. That’s what the (Guide to eating out for a salesman is all about). So the quest is Chennai. I still like Madras.There is no better way to arrive In Madras, than in an Indian Airlines flight (now, Air India I still like, Indian Airlines), the Mamis and Kelavans (Aunts and Grand Uncles) are all their with theirplastic baskets, vermillion and vibhuti (totems on the forehead) . You already feel you are in Madras enroute. Received by an enormous air conditioned Amabassador car ( adds more authenticity to the trip). The mornings in Madras are the way Indian mornings may have been in the many centuries ago, floors washed Mugu/ Rangoli on the main gate, Music in the air then self performed (now Suprabhatam on the music system), Flowers, Incense, Prayers , grinding of the Idly barter and chutneys and the Arabic addition the heavenly smell of freshly brewed coffee. It’s still pretty much the same. Amidst all this morning melodrama, I had to visit Murugan Idly shop, though not of the pedigree of MTR and Vidhyarthi, Murugan in is relatively new in Madras (6 outlets), Singapore (2 outlets ), Madurai the original Murugan Idly shop has three outlets. The Madras outfits are under a decade old, despite that they have made a mark in the traditional Madras breakfast outlet market. It’s not cheap by Madras standards. 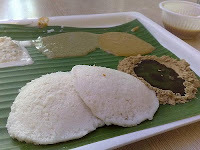 I had two idlys with four chutneys (pure coconut, tomato, coriander and mint, in Madurai I believe they do 11 chutneys), with Sambhar of course and extras for malgapodi (commonly known as gunpowder, a creamy and pasty and dark feel to it) and ghee. An enormous vada, very crisp and very nice and a plain dosa with an excellent tumbler of filter coffee. The taste of coffee that lingers and stays with you for 15 to 20 minutes after you drink it. All this for Rs 99/- (under my Rs 100/- mark). That’s quite a place and price for Madras standards, well within reach of the Slum dog Salesman Sam aka Agent Sam. A thing that intrigues me often is the price of tender coconut, no matter where you go in India the price is nearly the same, In Delhi its Rs 15 to 20, same in Mumbai, same in Kolkatta and surprise Rs 20/ in Madras. Despite transportation labor and margins. That’s pricing efficiency with little arbitrage margins like Gold. So many places to go so few meals (there only that many times you can eat in a day). On the list are Ponuswamy, Anjapaar, Anbu Mess, Kalpakka etc, as had done the Amravathi, Karaikudi, Buhari and others on previous visits and stay in Madras. Another debunking of my pet theories on this trip, if you are having a thali and add ons, sit in the main hall and not in the air conditioned farce. 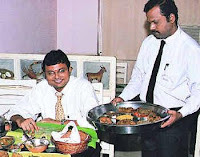 As, in all these places you get better and quicker service and hot quality food in the main hall e.g., Gujarati, Thali, Mumbai, Delhi, Kolkatta and even Bangalore (Koshy’s and Bheemas). As the farce called AC has lower guest to waiter ratio, slow service, cold food and higher prices with less variety and authenticity. However, this does not hold good in Madras which is still extremely hierarchical and realizes AC means wealth and power hence you are genuinely wooed there. Lesson unlearnt and new one learnt. Idyllically playing with his Curd rice in KaraiKuddi, a friend a drummer and a musician said Karaiku ddi is fine you have to go to Ponuswamy’s (many moons ago). S we were at Ponusamy’s at Roypettah. Like all famous eating places everything is a chain of restaurants in Madras, we went to one of them. Lesson had not been learnt yet,we decided to sit in the main hall and ordered, Mutton sukka, Crab Masala, Chicken Chettinad, a plain gravy (complementary, all meals down south we discussed is all about add-ons and more value adds), two meals (complete with rice rasam, sambhar, curds, pappadam, and vegetables) with mineral water cost us Rs 426/- about Rs 213/-each, but we had a field day. The Crab masala and mutton sukka were memorable the chicken Chettinad was imminently forgettable. Here I must complement my dear wife, dear Praveen and who is a south Indian food afficionado is as an accomplished cook with a focus for South Indian gourmet food , makes a much better chettinad chicken (quite an accomplishment considering she grew up in heartland Punjab). Raghu a Colonel in the Army and looks after the Girls Battalion of NCC at Madras, (I often smirk and remind h im to keep away from their Knickers, i.e. the girl cadets). He is doing a fine job in training the youth and inculcating discipline, courage, honesty. Though it may seem like a joke in today’s day and age, but I think he and the NCC make a difference to atleast 10% of the lives that they touch. He and the Project Manager from Madras, Vikrant, whom I call affectionately decided to meet for a drink at the Madras Gymkhana (mind it, its still called, Madras Gymkhana). It is125 years old and all serving Army officers in Station are invited as members, also because the Army owns the land, where the club is loc ated. Imagine, a night by the beach at the Madras Gymkhana in 1884. We armed ourselves with a couple of drinks and headed to Kalpakka a Kerala cuisine place near the Music Academy, came recommended by Alex and now these Malayalee gents were smiling at chomping into Syrian beef fry. Raghu had been here 25 years ago and Vikrant, had heard of it (or had been there). We entered and occupied the Air conditioned cabin and were served by a Nepali Gent, strange, Kerala food served by a Nepali in Madras. So here goes, two Syrian beef fry, prawns masala, Kari Meen Fry (pearl spot fish), Omelets, Vegetable stew, Four appams and four Kerala parothas with unlimited Chukku vellum herbal warm water, was at a grand sum of Rs 525/- amazing Rs 175 each , mind we were in the air conditioned super service. We were stuffed and trooped out. 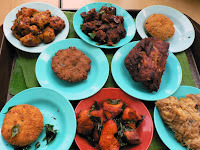 Madras is a charming place which has the Southern comforts of Spice, Silk Smitha and Shakeela (Kodambakkam style). Dreaming of the surreal food at surreal prices. I drifted into a food coma, thinking of the sumptuous meals and ample bosomed and well endowed Kodambakkam Beauties. Only when I wa s settling down from the holiday in UK and beginning to understand the finer distinction between, Irish, Scotish, Welsh, Cornish food and drink and gloat about writing my newly acquired knowledge on the blog. I was confined to the walls of the Escorts hospital and the food within it, albeit it was my father whom I was emotionally nursing. I was nourishing myself from the cafes and a dhaba owned by Wasim with the most amazing bread omlettes and Chai around the hospital. Dearest wife Prav een tried to cheer me and my dear brother Sanjiv with her famous chettinad cuisine, outings to the Machaan, a dinner night at China Garden et al. Nothing seemed to bring me back into the fold as my head and heart was lost in atrial fibrilliation, aortic stenosis, diuretics, prothombin tests and betablockers apart from the trauma of a double open heart surgery for my dear father. At best I could have been an obedient dutiful son and a nervous bank clerk rolled into one. I did have sparks of action, thinking ahead of the game, the planner and strategist. However hospitals and doctors have their pace. All is well now. Still I could not tear myself away and indulge in the urban pantry of my desires. I termed it a eaters block and perhaps momentary lapse of reason owing to the pshytropic journey we had been through. Then all of a sudden, an evening out, at good old Connaught Place. We dropped in at The Oriental Fruit Mart and Stores (The Food Store). You enter and are greeted by the two cheerful sons Ravinder and Jitender apart from the tubelit space and dark wood and glass showcases and stock cupboards, they have almost everything we need, we buy sardines, tuna, cream cheese, wasabi peas, diet chocolate and whole lot of other stuff. Though the packaged meats section is a bit weak. They make up with canned and tinned stuff. It brought me back from my writing slumber and motivated me to write, my affiliation with processed food , meat, canned food goes back to era of the early 70s when Superbazaars were set up by the govt (This one was in Viashapatnam aka Vizag aka Waltair in AndhraPradesh) as a huge department store, it had everything from groceries to furniture to grinders to newly introduced HMT watches to custom confiscated goods including swiss watches and stretch lon trousers and bush shirts that lasted a lifetime. And, it had a meat section with piggery products from Ghanavaram and this was my favourite section, as it also had a mini zoo next to the parking lot. Who said the government can’t get it right. 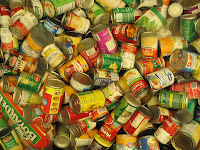 My second tryst with canned food was shrimps, tuna, mackerel at a cooperative department store in Coimbatore (in Tamil Nadu) called Chintamani, while my parents shopped, I gazed at the canned food lost in a world of Enid Blyton's description of the feasting from the larder by the Famous Five. Sardines on biscuits, ham sandwiches, canned peaches and tinned cheese with tongue. Phew some of that was available right before my eyes. Cut to t he present, The Oriental Fruits Mart located at E Block in Connaught Place, close to the legendary store Giggles (the grand uncle and precursor to Archies stores) at E Block, offer and complement the heritage of Connaught Place and Delhi. 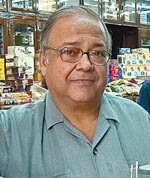 The Oriental Fruits mart was set up by Brat Pal Arora in 1939 (which makes it 70 years old). It’s a food store stocking, from caviar and sturgeon /salmon roe to pomegranate syrup to churozio sausage. Its currently owned by Mahinder Pal who lives in Kamla Nagar and his helped by his sons as mentioned earlier, Jitender and Ravinder. Really friendly people. Many years ago I often crossed the store, saw the exotic fruit and thought that’s not for me and I had been on this trip of buying and eating local produce. Eat what is available around you rather than something flown in from a distant land, and would be formidably expensive. However for the time being I have let the inhibitions aside and immersed in the choicest of food , fruit and meat. Do try the store it offers great products at decent prices with excellent and friendly service. It helped me get back on track and back on business of the gastronomic pantry of desire. Thanks !